Oil has become the world’s most important source of energy due to its high energy density, easy transportability, and relative abundance. In the early twentieth century, oil exploration began in North America, with the United States becoming a leading global producer by the mid-1900s. During the 1970s, U.S. oil production plateaued, eventually allowing Saudi Arabia and Russia to surpass it as the leading global producers. More than 80% of the world’s proven oil reserves are located in OPEC Member Countries (65% of the OPEC oil reserves are located in the Middle East). Crude oil is usually found in association with natural gas in the reservoir, and since the composition of gas is lighter, the associated gas forms a ‘gas cap’ over the petroleum (Exhibit 4). Oil can be found in different forms, including as a semi-solid state mixed with sand and water, as in the Athabasca oil sands in Canada, where it is usually referred to as crude bitumen. Oil will normally be classified into conventional and non-conventional categories but unfortunately there is very little agreement on the exact boundaries of these terms. Generally, conventional is defined as oil production from primary or secondary recovery methods that exclude oil from coal and shale, bitumen and extra heavy oil, and liquids from gas plants (natural gas liquids, or “NGLs”). Primary recovery is the extraction of resources through drilling wells and by relying on natural pressure and pumping to recover the oil. Secondary recovery involves the injection of water and other substances to increase reservoir pressure to recover the oil. Both of these recovery methods will be discussed in greater detail below. For the purposes of this report, “tight oil” drilling, through the implementation of horizontal drilling and multi-fracture technology, will fall under the definition of conventional oil production. Conventional oil has a characteristic of a depleting profile, as production rises rapidly to a peak (or multiple peaks) before declining hyperbolically. Many of the world’s sources of conventional oil are in decline. The conventional oil reservoirs that were abundant and easy to find 30 years ago are now harder to locate and more costly to develop. The evolution of horizontal drilling over the past 10 years has allowed previously uneconomical reserves to be accessed. 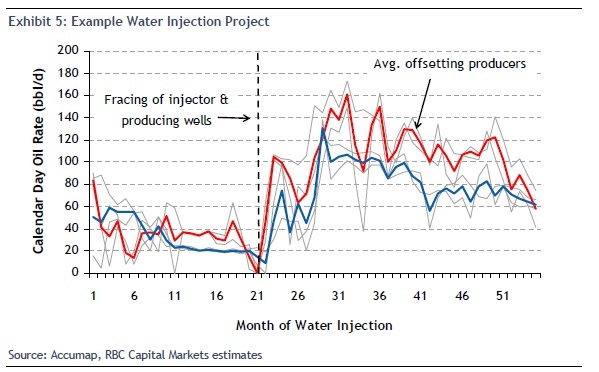 Although the projects are more economical, the decline rates of a horizontal well are usually much greater, forcing companies to fight constant declining base production levels. Geologists and geophysicists are at the frontier of any oil and gas company as they use well control and seismic surveys to search for geological structures that may form oil reservoirs. Seismic surveys involve creating a sound wave and observing the seismic response, providing information about the underground geological structures. Once a reservoir has been identified, an oil well is created by drilling a hole into the reservoir rock with a drilling rig. Historically, oil reserves were only developed using vertical wells, but in recent years companies have been able to drill horizontally, increasing reservoir contact. The evolution of fracture stimulation techniques has allowed companies to flow more hydrocarbons from tight rock formations, which vary in tonnage, interval spacing and use of fluids, as engineers will design specific fracture techniques for a given formation. Starting in the primary recovery stage, reservoir drive comes from a number of mechanisms, which can include natural water displacing oil downward into the well, expansion of natural gas at the top of the reservoir, gravity drainage resulting from the movement of oil from the upper to the lower parts of the reservoir, and through pumping of the well. Although the use of fracture technology employs outside sources to initiate the flow of the fluids, it is now being considered primary recovery as it becomes more of an industry standard. Recovery in the primary stage is typically 5%–20%. The final phase of production is called tertiary or enhanced oil recovery (EOR). This begins when secondary oil recovery isn’t enough to continue adequate extraction, but only when the oil can still be extracted profitably. Tertiary recovery depends largely on the cost of the extraction method and current price of oil. There are various forms of EOR, including thermally enhanced oil recovery (TEOR), which heats the oil to reduce its viscosity and make it easier to extract. Steam injection is the most common form of TEOR, where a nearby plant will generate electricity and the waste heat is used to produce steam, which is then injected into the reservoir. A less used technique is to inject surfactants (detergents) into the reservoir to alter the surface tension between water and oil. Typically, EOR allows an incremental 5%–15% of oil to be recovered from the reservoir.